It's been 80 years since Walt Disney Studios premiered Snow White and the Seven Dwarfs. The first full-length animated feature in English and Technicolor, Disney’s idea for the movie was dubbed “Disney’s Folly” by a contemptuous and ridiculing film industry, but, as with many Disney gambles, Walt got the last laugh. Adjusted for inflation, Snow White is still one of North America’s Top 10 grossing films of all time, has spawned countless TV and movie spin-offs, and just happens to feature a talking magic mirror. The technology behind movie magic steadily advanced during the 1950s and ’60s, and Snow White was ultimately eclipsed as a top earner by science-fiction films such as Star Wars (1977) and E.T. the Extra-Terrestrial (1982) , but it wasn’t until 2018 at the Consumer Electronics Show (CES) that we finally got a real-world look at that talking mirror. Launched by Kohler at CES, the Verdera Voice Lighted Mirror brings an embedded Amazon Alexa into the bathroom via voicecontrolled medicine cabinets that do everything an Amazon Echo can. Envisioned as the centerpiece of the Kohler Konnect portfolio of smart products, Verdera also controls other Kohler products by voice and has voice-controlled LED lighting. 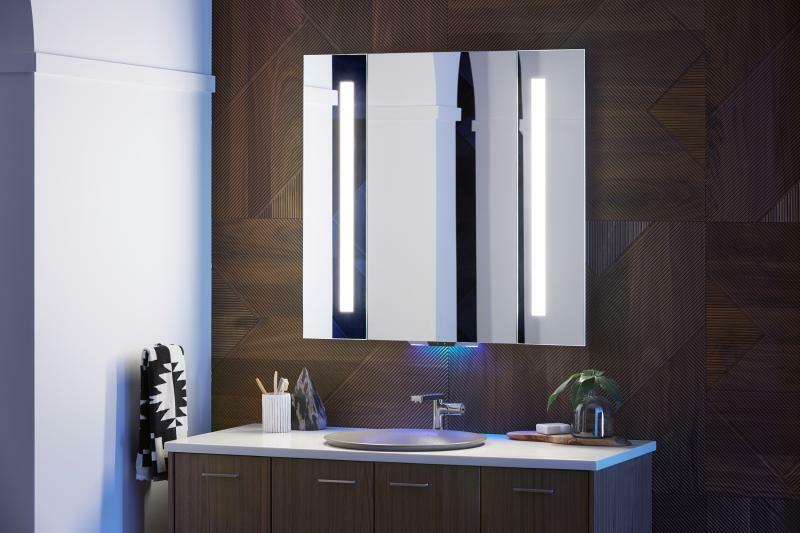 The Verdera Voice Lighted Mirror features dual microphones to power the unit’s embedded Amazon Alexa and Kohler Konnect voice-command functionality. Embedded stereo speakers, a motion-activated night light, and dimmable LED lighting adjustable to 1,000 lux is available in 24-inch, 34-inch, and 40-inch models. High-tech medicine cabinets have been a long time coming for residential construction pros who were still installing standard mirror-front units—even as luxury hotels began migrating telephones, televisions, and USB ports into bathrooms. The bathroom is arguably the home’s most private space, so it’s understandable that it’s the last smart-home frontier, even if that frontier is ultimately set to vanish with the introduction of Alexa and Apple’s Siri. Similar to smart tech in other parts of the home, connectivity in the bath is accompanied by strong homeowner desire for unobtrusive technology. On the back end, that means installing more gangable boxes in vanity areas to meet the wiring demands of advances in glass and mirror-based display technologies, putting the medicine cabinet front and center as the commode command dashboard. The chrome-profile XSquare mirror’s main light, ambilight, and defogger can be adjusted using a contact-free control panel built into the glass. Stepless adjustment of LED light color enables varied light settings to 300 lux that can be recalled via memory function. Interiors boast improved organization with optional storage boxes and a magnetic strip for accessories. Schroeder’s mention of clean design keys in to the importance of modernity in bath design in general, and vanity and cabinet design in particular. Designers say unbroken lines, flush profiles, and muted tones in whites, off-whites, and grays are likely to rule the day through 2019 as homeowners seek cool, contemporary retreats that induce relaxation and rarefied privacy. 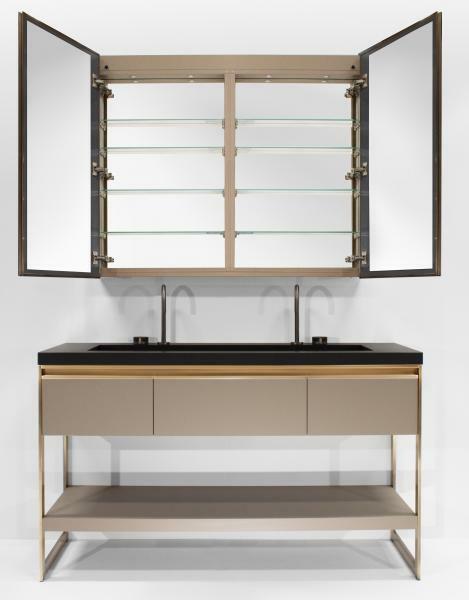 Framed mirrored cabinets are designed to complement the maker’s Avalon and Avento lines of freestanding and wall-hung vanities. Options include downlights and uplights, 1-inch interior LEDs, and internal power outlets to meet consumers’ increasing demand for wall-to-wall and alcove-recessed mirror storage. In tandem with internet connectivity and voice-command technologies, built-in lighting controls are getting serious attention as vendors explore the boundaries of color and luminosity made possible by LED lighting. “We’re adding downlights and uplights to create more ambient lighting, and warm white lighting is always key, as well as full diffusion to hide the LED dots commonly seen these days,” says Hib Johnson , president of The Furniture Guild, in Canton, Ga. In researching form, function, and technology for the Verdera line, Kohler found a need for bright, consistent lighting whether consumers were engaged in hair, makeup, grooming, or oral care. 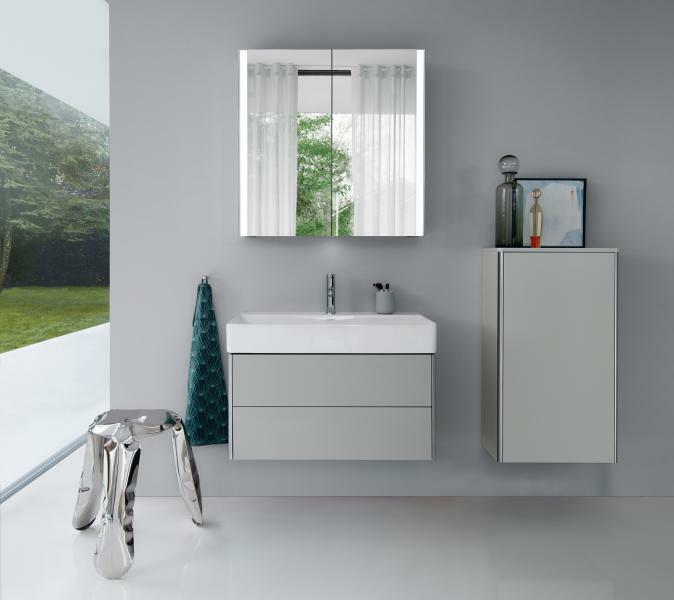 Duravit, too, has introduced advanced lighting controls with the XSquare mirror , offering a memory-enabled, continuously adjusted lighting tone from 2,700K to 6,500K to match natural circadian rhythms. Indeed, if we’ve finally realized Disney’s 1937 prognostication of a magic mirror on the wall, optimal, task-based mood lighting should help us to—at least momentarily—feel like our own Princess or Prince Charming. And if we’re ever unsure, at least we can finally pause while flossing to ask Alexa who really is the fairest one of all. 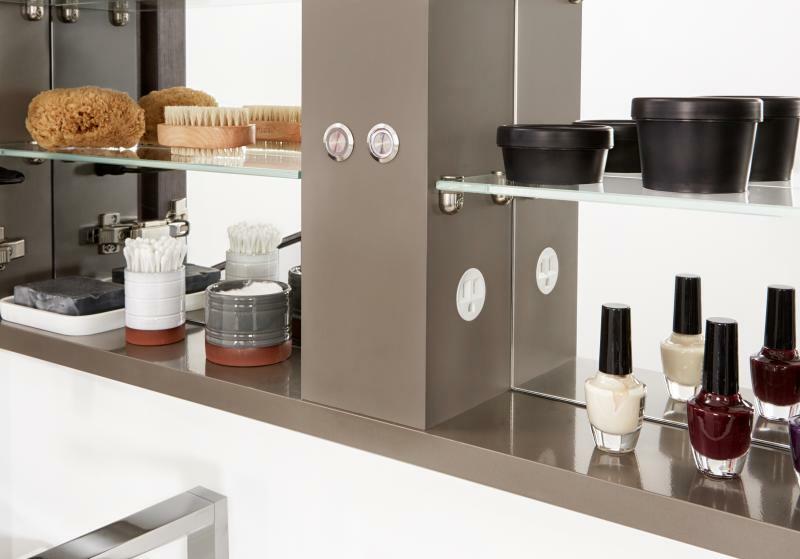 Frame Linea medicine cabinets feature an aluminum frame and mirrored interior, as well as electrical sockets for charging various accessories. Optional LED mood lighting and defogger functions can be added to the mirrored doors. This story originally ran in the July/August issue of PRODUCTS magazine. See the print version here.